From the Russian point of view, Israel is a useful friend given its unparalleled access to the U.S. Congress, the White House and the American media. The Netanyahu government also understands Moscow’s concerns about radical Islam in the Arab world and Central Asia and is willing to share information that it obtains to contain the problem. For both Israel and Russia, terrorism is not an abstraction – it sits right on and even inside their borders. Even though Israel is undercutting the neocon plan to isolate and punish Russia at every opportunity, people like Bill Kristol, the Kagans and John Bolton make no effort to criticize Netanyahu for his temerity. It is a policy of deliberately looking the other way and it underlines the essential phoniness of what the neoconservatives stand for. To put it bluntly, the neocons claim to support American military dominance globally for altruistic reasons but the reality is that they are largely in it for the money as well as the political and media access to power that money brings with it in contemporary America. What would Sunday morning talk shows be like without a beaming Bill Kristol? And the cash for the neocons comes mostly from defense contractors who are eager to have a clearly defined serious enemy to boost military spending coupled with an articulate group of pundits who insist on seeing threats worldwide and are willing to promote that viewpoint. Keeping the cash flowing to fund that nice corner office with a view of the Capitol even trumps the Israel relationship, but the neocons are careful to make sure the two issues never bump up against each other when they are fulminating against Obama’s national security policies. We are currently witnessing neocon perfidy at its most refined. They are jumping over themselves to support Hillary Clinton for president in spite of her manifest corruption and unreliability because Donald Trump has threatened to do two things: first he has expressed his unwillingness to enter into new wars in the Middle East or anywhere else, and second he has stated that Washington should be even handed when attempting to negotiate peace between Israel and the Palestinians. Both are anathema to the neocons and Trump has further complicated matters by indicating that he would be willing to talk with Vladimir Putin. If Trump were to win, many neocons would likely find themselves having to look for a real job, a terrifying prospect for people with few skills to fall back on. Hillary Clinton, on the other hand, will do what is right from the neocon point of view – confronting the world one nation at a time starting with Iran, which she has threatened to “obliterate.” She will also need to boost defense spending to support her wars, will stiff Vlad, and will allow Bibi to move in down the hall at the White House as Bill will often be out on the town and his room in the East Wing is not needed. 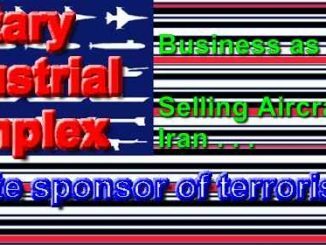 The creation of enemies unnecessarily, as applied to both Iran and Russia, is a symptom of the neoconservative disease. It is a pointless search for full spectrum military dominance that panders to an inchoate fear that the U.S. is surrounded by foes that can only be dealt with by decisive kinetic action which will require large defense budgets. Today’s neo-conservatism is a movement born from a curious amalgam of interests that have come together at a time when the United States is in reality militarily unchallenged worldwide and is threatened neither by any other country nor by the pinpricks inflicted by terrorists. Neocons and their associated liberal interventionists have to an extent dominated the foreign and defense policy thinking of the two major parties and most of the media, but their message is ultimately based on emphasizing national insecurity, which in the current context is somewhat inexplicable. The United States has never been more secure internationally, if not domestically, and the only problems it is confronting are themselves part and parcel of the imbroglios that have been engineered by the interventionists and their friends. Speculation is that a Trump victory will actually end their dominance. If that is so, it might just be sufficient reason to vote for Donald Trump.